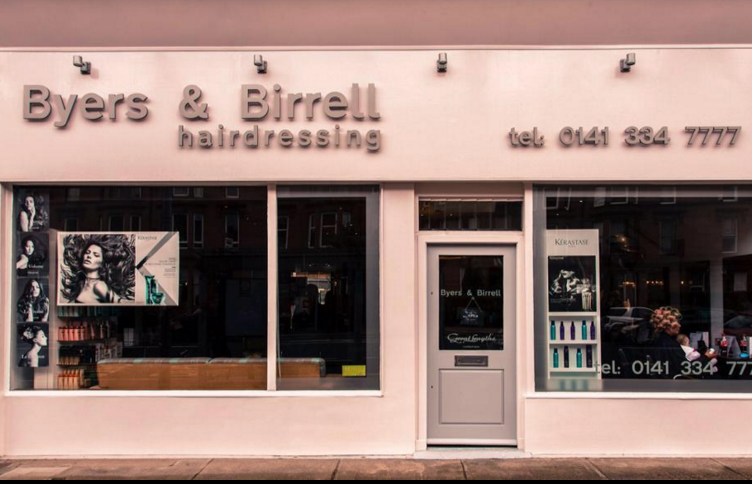 Situated in the trendy West End of Glasgow, Byers and Birrell is a smart, stylish award winning hair salon offering clients the ultimate hair styling experience. There is a professional and friendly team waiting to welcome everyone - ladies, gents and kids - for a quick trim, a full cut and colour or for one of the relaxing treatments on offer. The team at Byers and Birrell believe in excellence and ensure that clients enjoy the relaxed setting. This philosophy is instilled in every member of staff from the newest junior to top stylists all of whom are happy to draw on their wealth of knowledge and experience to offer the best possible advice on colour, style and condition to ensure every client leaves with a spring in their step and hair they love. No matter if you are looking to transform your look or just neaten up, the team at Byers and Birrell are on hand to help make your hair dreams come true. Why not pop in and meet the team to ask advice or make a booking. Our location in the heart of Glasgow’s West End makes us easy to find whether you are coming from the city centre or further afield. Been coming here for nearly 15 years and the salon has a lovely friendly and professional vibe. You feel you are being looked after by the best. Excellent, very attentive staff. My hair looks the best it has in years. From the minute you walk in the door until you leave you are spoiled with great service. Extremely knowledgeable team who take the time to understand what you need with a lovely atmosphere. Colour and cut as always was perfect! Derek has been tending to my hair since circa 1992 before and during Byers & Birrell life where I have also been attended very well to by Elise on many occasion also. Professional and friendly service but I have to add that they’re like a family also,... most welcoming. A lovely place to go and I also speak on my mother’s behalf as she probably visits on a weekly occurrence and enjoys every trip there. Friendly, helpful and extremely competent. I trust them implicitly with my unruly hair. I’ve been going to B&B for years and I can’t recommend the team enough. Everyone is always friendly, warm and professional as well as very attentive. It’s a well run salon, a relaxing experience, stylish & spotlessly clean with top class hair stylists & colourists. I love this salon all the staff are totally professional and also so friendly, Zoe does a wonderful job of my hair always leave this salon feeling good . Thank you guys . After bouncing around Salons in both Edinburgh and Glasgow I’m now a loyal customer of this great Salon. Staff are super friendly, know their stuff and have given me complete confidence in hairdressers after having a few really bad experiences at other “top” establishments. Can’t recommend Nicola, Derek and the Team highly enough! At last I enjoy going to have my hair done as I've always felt uncomfortable about being in hairdressers. Elise is great for me! Thank you Elise! I’ve been going to Emma for a while and have never had a bad experience always very friendly and I enjoy going there haircut always great. Blow dry with Zowie. She always knows what I need and does it brillintly. All the staff are attentive friendly truely professional. After moving to Glasgow and failing to find a hairdresser I could trust I was recommended to go to Nicola. I wouldn’t go anywhere else now, she knows exactly what my hair needs and I’m always 100% happy. Been a customer for 20 years. Always greeted with a welcoming smile. Derek knows what suits me and friends comment on my colour. Caitlin does a great head massage. Brilliant Salon. A wonderful salon. Charming, friendly staff, perfect ambience, lovely tea and biscuits and of course a gorgeous hairdo. What more could you ask? As always , meet with a friendly face cup of Tea and biscuit and more to the point professional service . I have recommended B&B to lots of my friends . Amanda does my hair but they are all excellent .